This book introduces readers to the history of the novel in the twentieth century and demonstrates its ongoing relevance as a literary form. A jargon-free introduction to the whole history of the novel in the twentieth century. Examines the main strands of twentieth-century fiction, including post-war, post-imperial and multicultural fiction, the global novel, the digital novel and the post-realist novel. Pays attention both to the practice of novel writing and to theoretical debates among novelists. Claims that the novel is as purposeful and relevant today as it was a hundred years ago. Serves as an excellent springboard for classroom discussions of the nature and purpose of modern fiction. Jesse Matz is Assistant Professor at Kenyon College. He is the author of Literary Impressionism and Modernist Aesthetics (2001) and winner of Harvard University's Roslyn Abramson prize for excellence in teaching. 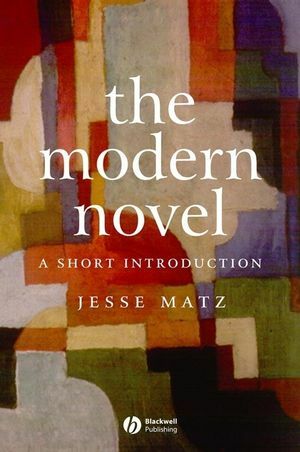 1 When and Why: The Rise of the Modern Novel. 2 “What is Reality?”: The New Questions. 3 New Forms: Reshaping the Novel. 5 Regarding the Real World: Politics. 6 Questioning the Modern: Mid-Century Revisions.